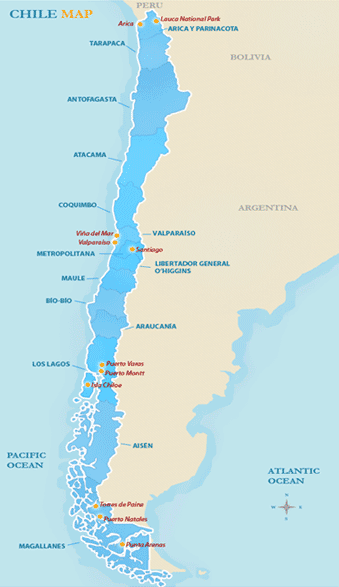 Here you will find basic facts and information about Chile. From suggestions on the best times to travel, to Chile’s culture and history, to how to get to and from Chile, our Chile Facts and Info will help you gain perspective on the country and regions you will be traveling to, as well as help you to become a well prepared traveler for your Chile vacation. Health risks: Traveler’s diarrhea is the most widespread travel-related illness; food and water precautions are essential. There are no vaccination requirements for entry to Chile, but a typhoid vaccine is recommended for long-term travelers not restricting their meals to major restaurants and hotels. Travelers visiting the Andes Mountains should be aware of altitude sickness, and ascend slowly to allow the body to adjust. Time: Mainland is GMT -4 (GMT -3 from October to March). Easter Island is GMT -6 (GMT -5 from October to March). Chile is a politically stable country, and travelers don’t need to take more than the common precautions. That being said, incidences of pick-pocketing and mugging are on the increase and travelers should keep a sharp eye on their belongings, especially in touristy areas and bus stations. Petty crime in urban areas is a fact of life; being conscientious and streetwise is the key to a carefree and pleasant trip. When traveling outside the urban areas, visitors are advised to stick to marked roads, obey all signs and seek the advice of local authorities if traveling to border areas, due to certain restrictions. Considering the different geographical regions and climates found in Chile, you’ll find there are perfect places to explore every season of the year. High tourist season is generally during the summer (Dec. – March), especially January and February. During these months you’ll find most areas open to visitors, though the high plain of the Andes tend to experience heavy rainfall. The prime season for winter sports is July through September; however this is also when you’ll find the slopes the most packed with people. Be sure to plan your trip to Patagonia outside of winter as you’ll find this magnificent region to the south all but impenetrable. Chile is a colorful country with a rich cultural heritage. Witnessing one of these vibrant and significant celebrations can be a unique doorway into a greater understanding of Chile culture. It is worth noting that hotel prices generally go up significantly at fiesta times and bus and air transport should be booked well in advance. New Year's Day – Celebrate the New Year in Chile! Easter Island is a particularly popular destination for an exciting festive Chile New Year’s. Fiesta de la Piedra Santa – Celebrated in Lumaco, every year on January 20, each family sacrifices a fowl while they ask for favors and give thanks for favors received. Singing, dancing, music and prayers continue on well into the night. Tapati (Semana Rapa Nui) – For two weeks every year January/February families compete against eachother in a wide variety of games spanning from horse-racing to swimming to body-painting. Fiesta de la Candelaria – One of the most important festivals in northern Chile, it begins on the first Sunday of the month and lasts for 9 days. Thousands of dancers perform in the Santuario de la Candelaria in Copiapo. Festival de la Cancion – Hosted by Vina del Mar, this international music festival features song competitions in various languages and genres. Campeonato Nacional de Rodeo – Held at the end of March in Rancagua, these national rodeo championships are a fabulous opportunity to interact with the local community. Easter – Festivals and ceremonies continue throughout Holy Week, when a priest usually washes the feet of 12 men. Fiesta de San Pedro - Vina del Mar celebrates the patron Saint of fisherman in this picturesque fishing community. La Tirana – Celebrating the Virgin del Carmen, this festival in Iquique in the north, brings in people from all over the country and across borders from Bolivia and Peru. It is an exhilarating combination of indigenous and Catholic folklore. La Pampilla – This festival in Coquimbo celebrates Chile’s independence from Spain and between 200,000 and 300,000 people flock to this city for the festivities. The fun kicks off on the 14th and the partying doesn’t stop for a week. Armed Forces Day- September 19th celebrates the armed forces with an enormous military procession through the Parque o-Higgins in Santiago. Fiesta San Francisco – Head to Huerta del Maule, Talca for this important huaso festival. Feria de la Voz Andina – Taking place in Putre every year, just outside Lauca National Park, this festival attracts top Andean groups, as well as cultural exhibitions. Dia de la Virgen – People come from all over Chiloe on the 8th of December to match a giant statue of the Virgen carried to the church. Christmas Day – Navidad traditions in Chile usually mean lots of hot chocolate and Pan de Pasqua, bread with candied fruit stuffing. Expect the cities and towns to be beautifully decorated in the Christmas spirit. Fiesta Grande – Attracting 15,000 pilgrims from northern Chile to march to Andacollo for ritual dances from a pre-Spanish past. The unit of currency in Chile is the Peso. You’ll find bills of 1,000, 2,000, 5,000, 10,000, and 20,000 denominations. 20,000 peso bills are rarely seen outside of Santiago. Coins are 1, 5, 10, 50, 100 and 500 pesos. Check official exchange rates before exchanging money. Santiago is probably the safest place to get the best rate. Higher denominations of bills are difficult to change in more rural areas. Casa de cambio’s can change your cash or travellers checks, though be sure to check the rates beforehand. You’ll find functional ATM’s at major banks, shopping malls, larger supermarkets, and at most Esso petrol stations. Visa, MasterCard and Diner’s Club are generally accepted in finer restaurants and supermarkets in major cities but be sure to ask first. Many thousands of years ago, the first peoples migrated south into South America, and eventually present-day Chile. With progress and technology, they eventually forgave nomadic lifestyles, for permanent ones and began settling the land with agriculturally subsistent communities. While the north of Chile is one of the driest places in the world, the southern portion of Patagonia, is alpine tundra and glaciers, resulting in significant historical and cultural differences between the regions. In the 16th century, the Inca Empire, at the peak of its reign, expanded to the south, and for at least a short while, replaced local structure with their own military administration down to the Aconcagua valley, near present-day Santiago. The Mapuche, the largest indigenous group in southern South America, were successful in resisting Inca forces and later Spanish attempts at conquest. Though in 1520, Ferdinand Magellan in search of a route around the world discovered the Southern Passage, now known as the Strait of Magellan, the next Europeans didn’t reach Chile until a little later with the Spanish conquest of Peru. In 1535, Diego de Almagro and Pedro de Valdivia traveled south along Inca trails in search of more rich empires to conquer. During their two year expedition they explored the lands in Chile but disappointed that no gold was found they immediately returned to Peru. Valdivia returned in 1541 to quickly conquer the land, found the city of Santiago, and begin developing the state he planned to Govern. It didn’t take long for a large Mapuche insurrection to emerge, resulting in the death of Valdivia. The rebellion remained a presence throughout the colonization of Chile; Spain’s reign early on was weak, due also in part to the lack of forces and interest in Chile which didn’t seem to hold great opportunities for riches. In fact, as the colony took structure, there was very little Spanish dominance south of the Rio Biobio due to the fearsome forces of the Mapuche which remained a strong presence in the south. The Chilean colony evolved over time to include two other very important groups of people in addition to the local people and the Spanish: African slaves and marranos – Jewish people forced to convert to Christianity by the Inquisition. While the slaves were brought to the New World for manual labor, the marranos came to escape persecution in Spain. These two groups of people, along with the indigenous peoples and the Spanish settlers now made up the Chilean colony. The marranos largely dominated the trade circuit, being prohibited from occupying higher positions of power. The governing Spanish realized that discovering or stealing gold wasn’t the only way to get rich in South America, and began using an encomienda system, which gave them the rights to indigenous labor and tax. By the end of the 17th century, it was difficult to distinguish between races as a new race of people had emerged called mestizo’s who were a mixture of foreign and local descent. Eventually the Creole class – American-born Spanish – already a bit weary of paying tributes back to Spain and following Spanish trade laws, were hearing news of Napolean’s invasion of Spain. In 1810, with King Ferdinand VII overthrown and in prison, to whom was the colony paying taxes. Almost directly a national junta emerged in the name of the imprisoned King and the autonomous republic of Chile within the Spanish monarchy; soon a movement for complete independence was born. The vice regal government in Lima responded quickly in an attempt to suppress the movement, and the war for independence began. After seven years of intermittent fighting, in 1817, Bernardo O’Higgins, Chile’s most legendary patriot, and Jose de San Martin, from the Argentine War of Independence, arrived in Chile to defeat the royalists once and for all. On February 12, 1818, Chile became an independent republic and O’Higgins became the first leader. Typical of most of the former Spanish American colonies, the period directly following independence was slightly unstable. O´Higgins was quickly overthrown and it wasn’t until 1830, that order was restored and a constitution was written by Diego Portales and his conservative forces. The constitution outlined a strong governing body in Chile with a powerful president, and Chile became a model for stability. Despite peaceful transitions of power and a strong structure, corruption still existed and power mostly lay influenced by wealthy family politics and the Roman Catholic Church; not a whole lot had changed since the colonial days. The second half of the 19th century was a strong period of expansion for Chile, developing greatly in the areas of agriculture, mining, industry and commerce. With military victories over Peru and the Mapuche rebellion, Chilean territory expanded in the North and South. In 1886 President Jose Manuel Balmaceda decided to undertake the problem of an oppressed class suffering in poverty. Taking on projects to revolutionize infrastructure and improve hospitals and schools, Balmaceda quickly became unpopular with conservative congress who were trying to restrict power to the poorer class. In 1890, tensions grew over a budget dispute and a civil war ensued resulting in the deaths of 10,000 Chileans. Congress defeated Balmaceda’s men and for the next 30 years presidents acted as puppets for congress which was pulling all the strings. In the beginning of the 20th century, economic growth resulted in the construction of railways, roads, ports, and a solid educational system. World War I lead to the collapse of industry which resulted in a revolution for a new constitution. The new constitution, written in 1924 granted more power to the president, but the Great Depression would lead to more economic stress and a series of instable governments. In 1964, the Chilean right-wing Christian Democrat, Eduardo Frei Montalva, was elected – with international support from the U.S. – and began the ‘revolution in freedom,’ which would accomplish an impressive amount of reform. Failing to satisfy everyone, especially some of the more rural workers, who with newly awarded rights and some education, had insatiable hopes of money reaching out to them, Frei Montalva left the people with mixed feelings about his presidency; generally, however, he was an enduringly popular president. Salvador Allende, a socialist who had narrowly lost the 1964 election running as a candidate for the Front for Popular Action party, an alliance between the Socialists and the Communists, finally gained the presidency in 1970. Allende, however was now the leader of a very divided community including his own coalition, made up of 9 different factions. He hastily tried to restructure the economy, nationalizing as many programs as he could, shifting Chile into a socialist regime. Initially his programs were a success, however the economy soon collapsed as private business began fearfully selling off their stocks, leading to a fall in industrial production which caused shortages, hyperinflation and illegal buying and selling. Tensions rose and with rumors of armed Communist factions, and conspicuous relations with Cuba, Allende drew unwanted attention from the U.S. With heightened states of fear from the Cold War resulting in boycotts from the U.S. and depleted currency reserves from all the national spending, few people were surprised when Augusto Pinochet led the military coup of September 11, 1973 with the support of Congress and the western international community. The brutality however did shock Chileans, as not only Allende died, but thousands of leftists were executed, and many more tortured; by 1978, 30,000 Chilean exiles had fled to Europe. Pinochet was a ruthless leader, known for his hatred of democracy. In 1980 he adopted a new constitution, which outlined a ‘protected democracy’ without political parties and with a strong ‘guardianship’ from the armed forces. After holding power for almost 20 years, Pinochet finally conceded to pressure from the outside world, and held presidential and congressional elections in 1989. In 1990, a peaceful transition of power put Patricio Aylwin Azocar in office and the return to democracy began. Chile’s recent dark history was not easily left behind, as Pinochet remained the Commander-in-Chief of the military until he retired to the Senate in 1998. He was arrested later on that year, in London for the murder and torture of Spanish citizens under his military regime. Today Chile is a model of political stability and is one of Latin America’s leading nations in human development, economic freedom and quality of life though income inequality remains a problem. Chilean culture is a vibrant expression of thousands of years of history and peoples varying from indigenous arts and crafts to religious fine art and sculpture, and ‘Bailes’ dancing traditional dances during carnival to ‘nuevo cancion’, the musical movement of the 1960’s using folk music to express political passions. Chile has also, earned the nickname ‘country of poets’ with a history of Nobel Prizes in literature. Traditional arts and crafts are windows into rich indigenous histories. The fine craft of Mapuche basketry usually made of willow was designed for domestic, agricultural and fishing uses. Beautiful carving and woodwork is found in the Atacama region using cactus wood. Cowboy equipment and clothing has been an important part of the huaso culture, and can be found all over the country. Gabriela Mistral, the first Chilean Nobel Prize laureate for literature (1945), was renowned for her simple style using traditional meter. The most famous Chilean poet of the 20th century, however was Pablo Neruda, who in 1971, also won the Nobel Prize for Literature. His poetic voice evolved throughout his career, using powerful imagery to eventually express strong political orientations. Traditional Chilean cuisine varies throughout the distinct cultural regions but in general, there are a wide variety of fruits and vegetables. Seafood is popular throughout the coastline, and other common dishes are meat pies and stews. Richly ingrained in Chilean culture is their wine, Chile being one of the largest exporters of wine in South America. Sports are very popular in Chile, particularly soccer, tennis and Chilean rodeo. Chilean rodeo, being unique to Chile, involves a team of two riders ride laps around an arena trying to pin a calf against massive cushions. Declared the national sport, it draws more spectators than soccer matches. Music and dance are a large part of Chilean culture. Music ranges from folklore, to pop music to classical music. Traditional instruments include pipes such as the queña, the trutruca horn and the kultrun drum. At the core of Chilean music and dance is the cueca, a courting dance for couples. A long and narrow nation, Chile is home to many diverse environments ranging from one of the driest deserts in the world to the tundra and glacier topped lands of the south. 80% of Chile is mountains, most of which are the stunning snow-capped Andes and their precordillera elevations providing magnificent backdrops from any point in the country. The rugged coastline is a combination of high bluffs and lengthy sandy beaches. In the far north lies the Atacama Desert, an arid and desolate place rich in copper and nitrates. The dry lands push most of the population to the coastline. It also contains a large section of the Andean plateau, home to the Chilean Flamingo. Just north of Santiago is the fertile valley with broad sweeping lands for cattle grazing and fruit growing. Dramatically different landscapes are found in the south, one of the rainiest regions of the world, and stunningly beautiful with snow-capped peaks a constant backdrop of the Lake District. Punta Arenas, at the southern tip of Chile, is the southernmost city of any appreciable size in the world. Chilean territory extends far west into the Pacific Islands and includes the famous Easter Island, a volcanic island, located 2,200 miles (3,600 km) from the coasts of Chile. Chile also claims sovereignty on a region of Antarctica. Beneath earth’s surface of the northern half of Chile is the telluric Nazca Plate that is creeping eastward making the country highly prone to earthquakes. In the 20th century, there were 28 recorded earthquakes in Chile. With distinctly different geographical regions found in Chile, weather patterns vary accordingly. Altitude is a major factor in the climate along with the cold waters of the Humboldt Current in the Pacific. The central region of Santiago has a well-defined climate divided into four seasons. Spring (Sept. – Nov.) is mild; Summer (Dec. – Feb.) is dry and hot reaching over 87º F (30°C) during the hottest part of the day and cooling off considerably at night, particularly on the coast. In general temperatures can vary greatly in a day along the coast and in the mountains. Fall is usually from March to May followed by winter (June – Aug.). This rough guideline won’t always apply to every region of Chile. It is always a good idea to check weather according to your specific travel plans and generally pack warm layers even if you are planning to be in hotter climates and vice versa. Traveling within Chile is very easy with the vast system of bus routes and planes connecting you north and south. Long-distance buses generally run on time, are comfortable and efficient. Generally you’ll find a main bus station in Chile cities, however, occasionally the bus companies have separate offices usually not too distant from one another. Renting a car or a motorcycle is a good idea if you are trying to reach remote places and you’ll find major rental agencies easy to find in tourist places. Train travel within Chile is a neglected form of transportation; there are some tracks in use in the central region from Santiago to Talca and Chillan to Temuco. Flights are expensive but will save you a lot of time. There are three principal domestic airlines, Lan, Sky and Aerolineas del Sur. In the southern system of islands, you’ll most likely need to take at some point. Getting around within cities isn’t very challenging as taxis are there to take you wherever you need to go. Chilean cabs are metered but fares vary. Santiago has an excellent, efficient metro system, convenient for navigating the nation’s capital. Bicycles are easy to rent for the day in most cities and touristy areas. Santiago is served by a dozen European and North American carriers and offers plenty of connections to neighboring countries. Crossings by land can be done from Peru and Bolivia, into northern Chile, and from Argentina into eastern Chile. Public transportation serves most roads across borders. Be sure to check ahead of time about road conditions as during the winter season the Andean passes in Central and Southern Chile can be impassable.